Bahujan Samaj Party has announced first list of 11 candidates for the upcoming Lok Sabha elections today. Most seats on which the candidature has been announced are going to polls in the first and second phase. 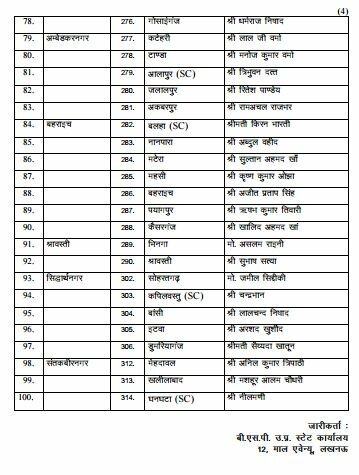 The list issued by party office in Lucknow includes JDS leader and turncoat Kunwar Danish Ali from Amroha. Ali, who was general secretary of the Janata Dal-Secular, quit the party and joined the Bahujan Samaj Party last week. The BSP also declared Haji Fazulrahman its nominee from Saharanpur, Malook Nagar from Bijnore and Girish Chandra from Nagina reserve seat. Haji Mohammad Yakoob has been fielded from Meerut, Satbeer Nagar from Gautam Buddh Nagar, Yogesh Verma from Bulandshahr, Ajit Baliyan from Aligarh, Manoj Kumar Soni from Agra, Rajveer Singh from Fatehpur Sikri and Ruchi Veera from Aonla. Mayawati’s BSP is contesting 38 of the 80 Lok Sabha constituencies in alliance with Samajwadi Party and Rashtriya Lok Dal. Meanwhile, Samajwadi Party has changed the candidate of Ghaziabad seat. Earlier Surendra Kumar alias Munni Sharma was party nominee for the seat but now Suresh Bansal will fight from this seat on party symbol.